Taiwan has a population of 23 million, of which some 500,000 are Aborigines. Recent conflicts over a national biobank as part of Taiwan's biotechnological industrial development, genetic research on Aboriginal origins, and commercialization of research findings involving Aborigines have raised a number of important ethical conflicts. These ethical conflicts involve on one hand, the importance of researchers' duties, and on the other hand, Aboriginal rights. This paper will go in three steps. 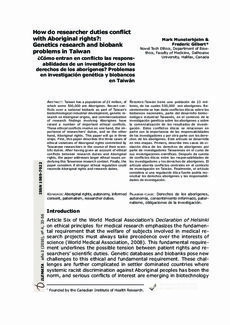 First, this paper describes the three cases of ethical violations of Aboriginal rights committed by Taiwanese researchers in the course of their scientific duties. After having given an account of ethical conflicts between research duties and Aboriginal rights, the paper addresses larger ethical issues underlying this Taiwanese research context. Finally, the paper considers if stronger ethical regulation could reconcile Aboriginal rights and research duties.